My Name is Emily Fuata and this is my story! I joined the local gym in September 2006 one month after the birth of my daughter. My goal was to lose weight and feel good about my appearance. 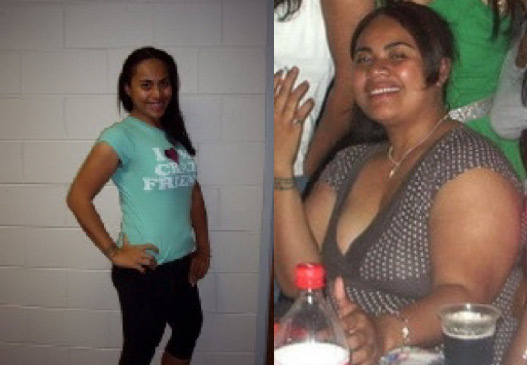 I started at 120kgs, and began by attending the classes and lost 13kgs on my own. But soon I lost my motivation after I found myself on a plateau. I not only needed motivation but to learn how to eat and train correctly. I could not do this on my own so I hired Nicky, an Instructor who taught my bike class that I loved so much. Nicky gave me all the encouragement, information and guidance I needed to get me out of my rut. With weekly monitoring and constant support I very quickly noticed change. I had a goal which was to weigh 75kg's before my trip overseas to America and China, which was scheduled for November 2007. I managed to reach 69kgs before leaving for my trip and broke my personal weight goal. I have managed to lose 48 kilo's in the last year and maintain this as well. Without persistence, consistency and staying focused with the help of Nicky as my trainer I would not be where I am today. I am now more agile and have a much higher self–esteem, to be able to live life and enjoy time out with friends and family. It's not just a physical change but a Lifestyle change. Emily lost 38 Kg’s in just over 16 weeks!